The story of Ona Maria Judge, slave to President George Washington who escaped his presidential residence in Philadelphia and fled by sea to Portsmouth, New Hampshire in May 1796, may be one of the most intriguing escape narratives ever told. I’d first heard of Oney Judge and Washington’s pursuit of her from a mind-expanding history of black freed men and slaves in New Hampshire called Black Portsmouth, written by Valerie Cunningham and Mark J. Sammons. In this work, historian E.A. Dunbar examines and interprets details of George Washington’s households in New York, Mount Vernon, and Philadelphia. 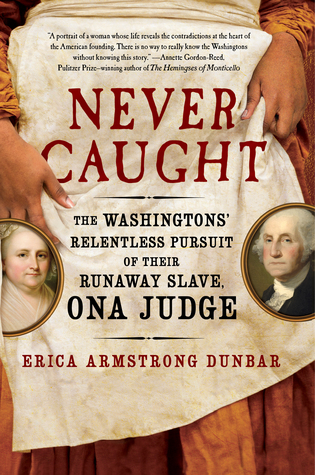 There are many intriguing holes in the narrative, but Dunbar hews closely to the facts she uncovered and adds her understanding of how a black slave in this period would have viewed the environment and opportunities. Dunbar describes the calculation a nubile slave would make when contemplating being passed to an owner with a history of sexual interest in colored women. The startling insight of the observation was clear the instant it was articulated and certainly was not found in original documents. Dunbar’s research succeeds in that it does what good nonfiction ought to do—it makes one interested to know more. In this case, Dunbar introduces us to an exceedingly interesting family dynamic—granddaughter Eliza Law ended up separating from Thomas Law eight years later, finally divorcing (!) in 1811—and advances a theory about why Thomas Law later freed Ona’s sister, who took Ona’s place as servant slave in Eliza’s household. I formed a different theory based on the information Dunbar gives us in this book, but mine would require more research before I could field it confidently. Ona’s sister, whose name was Philadelphia, appeared to have had a much easier life than did Ona. Philadelphia married a free man, William Costin, in Federal City, as the Washington D.C. area was then known. Costin, a mulatto, was illegitimate cousin to Philadelphia's mistress, and a free man. Ona had escaped to her freedom and struggled ever after with trying to balance making a living with preserving her anonymity. She lived as a fugitive eight miles outside of Portsmouth, in Greenland, which at that time must have seemed very remote indeed. The contrast between the lives of the two sisters is exceedingly tragic. I suspect they never knew the fate of the other, or we would have learned of it. "In her 1845 interview, Judge told of her journey to Portsmouth, New Hampshire, on a vessel that was commanded by Captain John Bowles. Judge remained secretive about her escape almost her whole life, only announcing the name of the captain more than a decade after his death in July of 1937: 'I never told his name till after he died, and a few years since, lest they should punish him for bringing me away.'" The second interview was published New Year’s Day 1847 in an important national abolitionist newspaper, The Liberator. The lack of opportunity to view these original documents makes it difficult to consider this history a full-blown success. One critic made the point that this might be considered a “young adult” history. This can be to the good: Dunbar writes clearly and simply, though she may allow some interpretation and stock historical detail to take the place of facts that might be relevant to the case she was seeking to advance. For instance, it seems strange that we did not learn more about the mysterious “French gentleman” whom George Washington assumed had abducted Ona and had gotten her pregnant. Washington was under this misapprehension for years, understanding what happened only in 1799 when Portsmouth’s head of Maritime Customs reported to back to Washington that Ona had married a free black seaman, Jack Staines, in Portsmouth in 1797 and bore his child in 1798. The story of Ona Maria Judge is immediately interesting to anyone who hears of it, both at the time and now. We may assume Judge wanted us to know what happened because she granted the newspaper interviews. This history is a good beginning to uncovering a ravishing story which touches on our interpretation of the earliest days of our nation and our first president. "Dunbar describes the calculation a nubile slave would make when contemplating being passed to an owner with a history of sexual interest in colored women." Sadly enough, it was probably THE calculation made by enslaved women on a daily basis. This is one of those things I find particularly galling about those who seek to romanticize the antebellum lifestyle of the plantation aristocracy--it was based on behavior, like locking women up to sexually abuse them in sheds for their entire life, that we rightly imprison people for today. Did every slave owner sexually abuse their slaves? Probably not. Was it a right no one challenged if they chose to? Clearly yes, as was the universal locking up in sheds part. Antebellum America (not just the South, obviously) had more in common with Silence of the Lambs than with Gone with the Wind! There is no doubt that slavery held many terrors, not the least of which was masters' perceived ownership of every facet of a slave's life. Just the fact that Washington never clued in to Ona's reason for leaving--that she was never taught religious instruction or to read in all her years with them--Washington continued to think of her as the "child" he raised rather than as the woman she became. Great point. The more mundane degradations of slavery are easy to overlook.